Alex Summers’ publication history dates all the way back to 1969’s X-Men #54 and while he’s not one of the original X-Men, he’s often lumped in with them (along with his longtime love interest, Polaris) because his first appearance predates Giant Size X-Men #1. 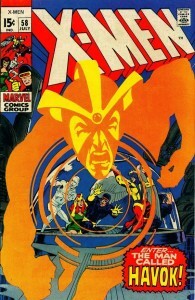 That issue introduced the first of many modern X-Men teams and brought the title back into publication after a long hiatus from new stories. The X-Men’s movie continuity, and First Class in particular, is very separate from the source material and that’s honestly fine by me. 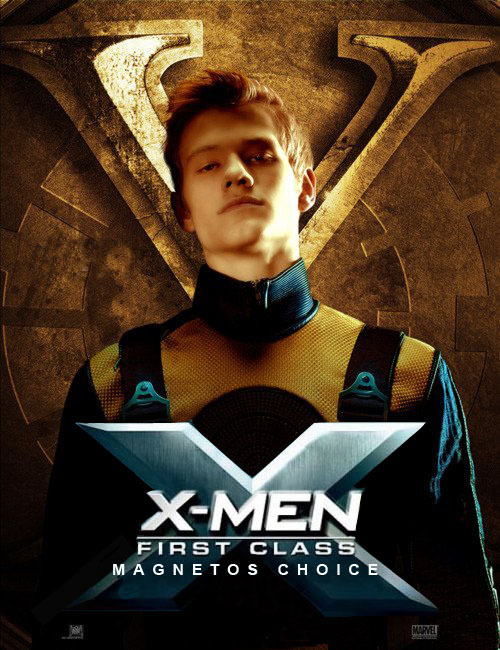 Havok has a lot of history behind him, but X-Men: First Class is a good first story for him in the X-Men’s movie universe. The inclusion of Havok and Banshee in the latest installment leaves only three of the classic X-Men team members yet to appear on screen: Polaris, Sunfire and Thunderbird (I’m not counting Mimic or Changeling, sorry), and it should be interesting to see if they’re featured in future films. In the limited scenes dedicated to Havok in First Class, the key elements of his character are incorporated into the film. I’ve always appreciated his fear and trepidation when using his powers, his reluctance to be a hero or a soldier, and his desire to be isolated. The dangerous nature of his abilities and his difficulty in controlling them make for a compelling limitation. He even first appears on screen imprisoned in solitary confinement although we aren’t told exactly why. It’ll be interesting to see if this is followed up in any sequels that may come. Actor Lucas Till plays the part well and certainly has right look for the character. Perhaps the most significant difference between the film and comic book versions of Havok is his relationship with his brother Cyclops. In the comics, Cyclops is his older brother and a member of Xavier’s original class of students. His connection to Cyclops is not addressed in First Class, but it isn’t specifically precluded either. He’s obviously not Scott Summers’ little brother given the timeline (unless we have a time travel story coming next and the comic books have certainly had their share), but they do confirm that his name is Summers. They go to the trouble of pointing it out, which they specifically didn’t do with Sean Cassidy, Banshee (granted he’s named after a ’70s pop star). 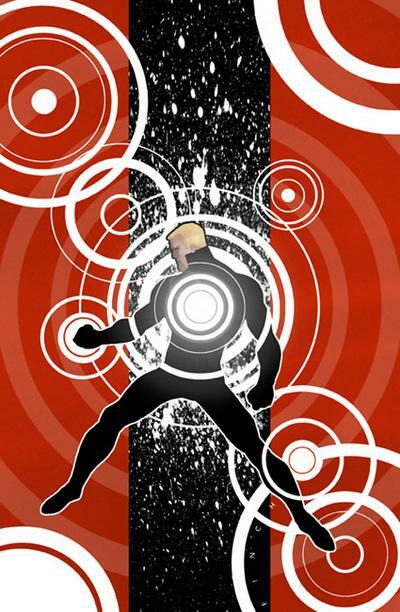 The choice to have his power signature appear red (in print it appears white) could be a nod to his association to Cyclops and his recognizable red optic blasts. These details suggest that the Summers family tree may be revisited in future movies, but freeing Havok from Cyclops’ shadow may be the greatest service the movie could do for the character. His jealousy is often the go to story for writers who don’t know what to do with him. All of the X-Men that have made it to the big screen have seen significant changes made to their costumes and uniforms. While I’m a fan of Havok’s various designs on paper, the movie look is far more appropriate for live action and the choice to use uniforms reminiscent of the original X-Men from 1963 was something I really appreciated about First Class. With Havok specifically, some significant changes were made to his design and powers and while they work visually, I don’t care for the red hula-hoop effect representing his energy or firing his plasma blasts from the chest. Co-centric circles and focusing his powers from his hands just makes for a cooler look in my opinion. At the end of the movie, you get an indication that he may have been firing from his hands in the final battle. The chest plate simply being a way to learn to focus his powers would actually be a nice way to get to that point. 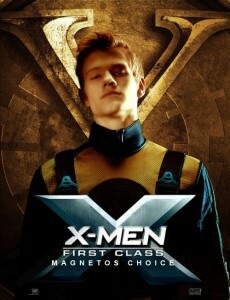 All told, I really enjoyed X-Men: First Class and I’m looking forward to seeing it again on DVD. It’s a nice introduction to Havok and he has his share of moments to shine among a large cast. It’s far more satisfying to see him introduced here despite all the changes than as a student in a crowd at Xavier’s School in X2 or as part of Magneto’s army in X3. X-Men: First Class is available today on DVD and Blu-ray and given its critical success, a sequel from Fox is likely on the horizon. and be sure to check out The Man Called Havok fan site. and will join the cast of Peter David’s X-Factor this November.